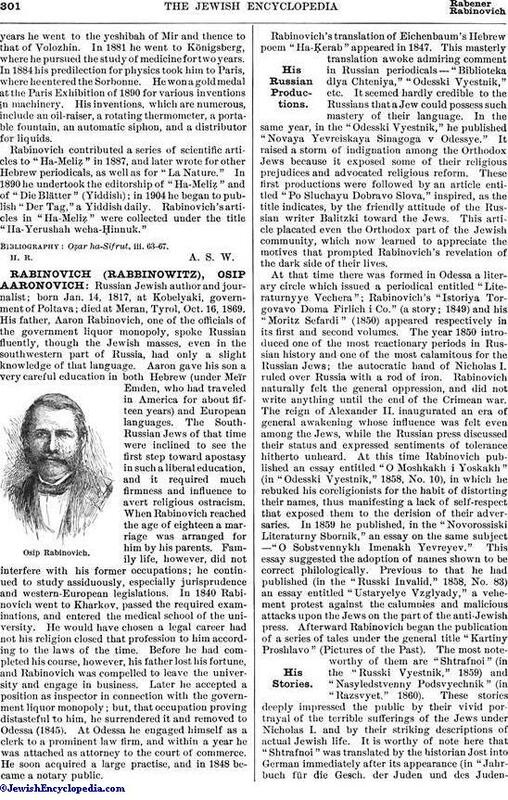 Russian Jewish author and journalist; born Jan. 14, 1817, at Kobelyaki, government of Poltava; died at Meran, Tyrol, Oct. 16, 1869. His father, Aaron Rabinovich, one of the officials of the government liquor monopoly, spoke Russian fluently, though the Jewish masses, even in the southwestern part of Russia, had only a slight knowledge of that language. Aaron gave his son a very careful education in both Hebrew (under Meïr Emden, who had traveled in America for about fifteen years) and European languages. The South-Russian Jews of that time were inclined to see the first step toward apostasy in such a liberal education, and it required much firmness and influence to avert religious ostracism. When Rabinovich reached the age of eighteen a marriage was arranged for him by his parents. Family life, however, did not interfere with his former occupations; he continued to study assiduously, especially jurisprudence and western-European legislations. In 1840 Rabinovich went to Kharkov, passed the required examinations, and entered the medical school of the university. He would have chosen a legal career had not his religion closed that profession to him according to the laws of the time. Before he had completed his course, however, his father lost his fortune, and Rabinovich was compelled to leave the university and engage in business. Later he accepted a position as inspector in connection with the government liquor monopoly; but, that occupation proving distasteful to him, he surrendered it and removed to Odessa (1845). At Odessa he engaged himself as a clerk to a prominent law firm, and within a year he was attached as attorney to the court of commerce. He soon acquired a large practise, and in 1848 became a notary public. Rabinovich's translation of Eichenbaum's Hebrew poem "Ha-Ḳerab" appeared in 1847. This masterly translation awoke admiring comment in Russian periodicals—"Biblioteka dlya Chteniya," "Odesski Vyestnik," etc. It seemed hardly credible to the Russians that a Jew could possess such mastery of their language. In the same year, in the "Odesski Vyestnik," he published "Novaya Yevreiskaya Sinagoga v Odessye." It raised a storm of indignation among the Orthodox Jews because it exposed some of their religious prejudices and advocated religious reform. These first productions were followed by an article entitled "Po Sluchayu Dobravo Slova," inspired, as the title indicates, by the friendly attitude of the Russian writer Balitzki toward the Jews. This article placated even the Orthodox part of the Jewish community, which now learned to appreciate the motives that prompted Rabinovich's revelation of the dark side of their lives. At that time there was formed in Odessa a literary circle which issued a periodical entitled "Literaturnyye Vechera"; Rabinovich's "Istoriya Torgovavo Doma Firlich i Co." (a story; 1849) and his "Moritz Sefardi" (1850) appeared respectively in its first and second volumes. The year 1850 introduced one of the most reactionary periods in Russian history and one of the most calamitous for the Russian Jews; the autocratic hand of Nicholas I. ruled over Russia with a rod of iron. Rabinovich naturally felt the general oppression, and did not write anything until the end of the Crimean war. The reign of Alexander II. inaugurated an era of general awakening whose influence was felt even among the Jews, while the Russian press discussed their status and expressed sentiments of tolerance hitherto unheard. At this time Rabinovich published an essay entitled "O Moshkakh i Yoskakh" (in "Odesski Vyestnik," 1858, No. 10), in which he rebuked his coreligionists for the habit of distorting their names, thus manifesting a lack of self-respect that exposed them to the derision of their adversaries. In 1859 he published, in the "Novorossiski Literaturny Sbornik," an essay on the same subject—"O Sobstvennykh Imenakh Yevreyev." This essay suggested the adoption of names shown to be correct philologically. Previous to that he had published (in the "Russki Invalid," 1858, No. 83) an essay entitled "Ustaryelye Vzglyady," a vehement protest against the calumnies and malicious attacks upon the Jews on the part of the anti-Jewish press. Afterward Rabinovich began the publication of a series of tales under the general title "Kartiny Proshlavo" (Pictures of the Past). The most noteworthy of them are "Shtrafnoi" (in the "Russki Vyestnik," 1859) and "Nasyledstvenny Podsvyechnik" (in "Razsvyet," 1860). These stories deeply impressed the public by their vivid portrayal of the terrible sufferings of the Jews under Nicholas I. and by their striking descriptions of actual Jewish life. It is worthy of note here that "Shtrafnoi" was translated by the historian Jost into German immediately after its appearance (in "Jahrbuch für die Gesch. der Juden und des Judenthums,"Leipsic, 1860), the whole edition of 4,800 copies selling within two weeks. Konelsky's Hebrew translation of "Shtrafnoi," under the title "Ben 'Onesh," appeared at Odessa in 1865. 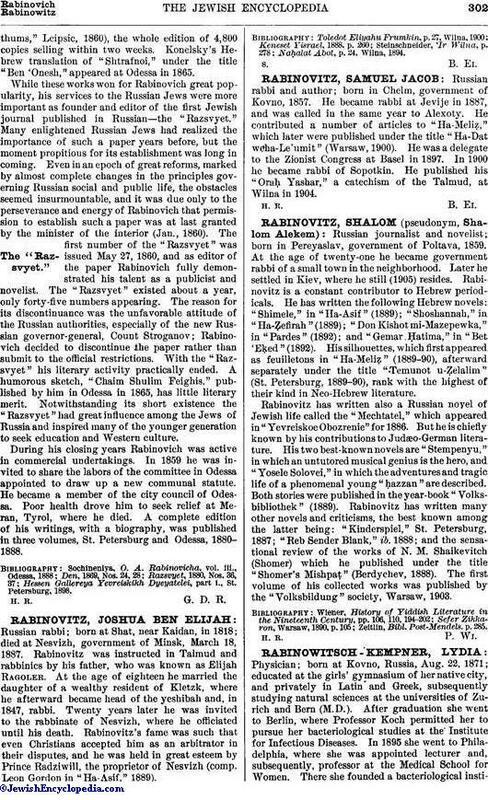 While these works won for Rabinovich great popularity, his services to the Russian Jews were more important as founder and editor of the first Jewish journal published in Russian—the "Razsvyet." Many enlightened Russian Jews had realized the importance of such a paper years before, but the moment propitious for its establishment was long in coming. Even in an epoch of great reforms, marked by almost complete changes in the principles governing Russian social and public life, the obstacles seemed insurmountable, and it was due only to the perseverance and energy of Rabinovich that permission to establish such a paper was at last granted by the minister of the interior (Jan., 1860). The first number of the "Razsvyet" was issued May 27, 1860, and as editor of the paper Rabinovich fully (demonstrated his talent as a publicist and novelist. The "Razsvyet" existed about a year, only forty-five numbers appearing. The reason for its discontinuance was the unfavorable attitude of the Russian authorities, especially of the new Russian governor-general, Count Stroganov; Rabinovich decided to discontinue the paper rather than submit to the official restrictions. With the "Razsvyet" his literary activity practically ended. A humorous sketch, "Chaim Shulim Feighis," published by him in Odessa in 1865, has little literary merit. Notwithstanding its short existence the "Razsvyet" had great influence among the Jews of Russia and inspired many of the younger generation to seek education and Western culture. During his closing years Rabinovich was active in commercial undertakings. In 1859 he was invited to share the labors of the committee in Odessa appointed to draw up a new communal statute. He became a member of the city council of Odessa. Poor health drove him to seek relief at Meran, Tyrol, where he died. A complete edition of his writings, with a biography, was published in three volumes, St. Petersburg and Odessa, 1880-1888. Hessen Gallereya Yevreiskikh Dyeyatelei, part i., St. Petersburg, 1898. H. R. G. D. R.